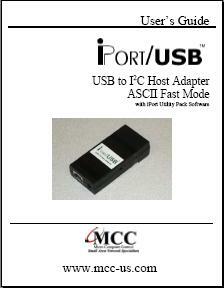 iPort/USB brings I2C directly to your PC. Just load our free software, plug the iPort/USB into your computer's USB port, and you will be sending and receiving I2C messages in seconds. Which I2C Adapter is right for me. Add I2C to Your Windows, Linux, or Mac OSX PC. Supports 7-bit addressing Standard (100k) and Fast (400k) Mode I2C Bus Activity. High Performance I2C Bus Co-Processor. Increased I2C Bus Throughput with Low Overhead. Selectable 23KHz, 86KHz, 100KHz, and 400KHz I2C Bus Clock Rates. Supports Bus Master and Slave, Transmit and Receive, and /INT Signaling. Supports Multi-Master systems with Arbitration Loss Detection. Compatible with 3-5V I2C, or 1.5-5V with our iVoLT Voltage Level Translator. Switch controlled I2C Bus Pull-Ups. Simple ASCII Text Ccommand Interface. Download our free iPort Utility Pack. Download our free iBurner EEPROM Programming Software. Download our free Microsoft .NET Class Library. Download our free iPortAI LabVIEW VI Library. Download our free Message Center for Linux software. Use our free Sample Programs and Development Tools to build custom I2C applications. Virtual Com Port based driver eliminates USB complications. Built-in ESD and Auto-Resetable Fuse Protection. USB-IF and WHQL Certified, CE Marked. Compatible with existing iPort/AI and iPort/AFM applications. eXtended Commands support 2-Wire, "I2C-Like", and low level signaling. 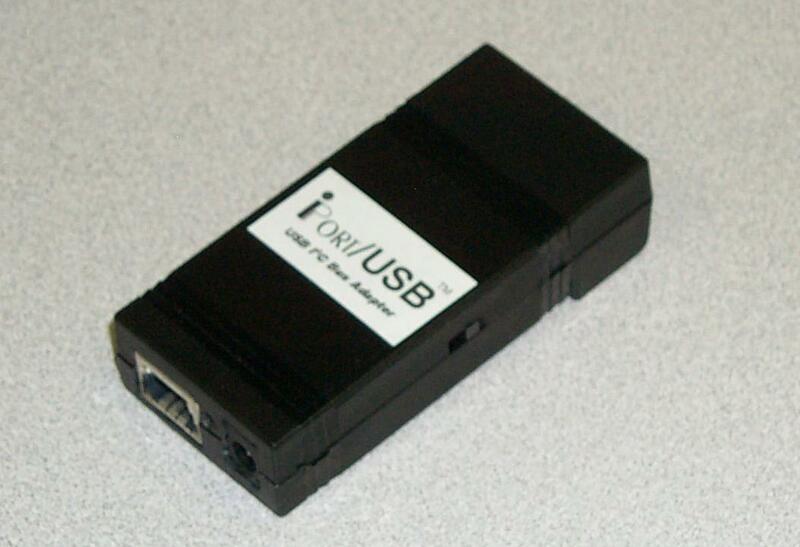 The iPort/USB is our fastest and most powerful I2C Bus host adapter. USB-IF and Microsoft WHQL Certified, the iPort/USB will operate with any Windows Vista, or XP PC. Typical applications include product development and testing, EEPROM programming, device control and sensor networking. Over the past few years, the I2C Bus has expanded from simple control to data intensive applications. As new uses arise, bus bandwidth and message overhead have become key issues in product design and testing. The iPort/USB, our fourth generation adapter for the I2C Bus, addresses these issues by supporting several I2C bus speeds, including fast mode (400kbit/s), and USB transfer rates up to 12 Mb/s. Implemented using a high-performance bus co-processor with optimized instruction set, the adapter also includes large message buffers (256 bytes) to reduce host computer and bus overhead. In addition to operating as a bus master or slave in a multi-master system, a built-in bi-directional /INT signal line allows the device to receive or generate "slave only" device notifications. Thanks to its USB-based Virtual Communications Port (VCP) driver, the iPort/USB will work with RS-232 based applications written for our iPort/AFM or iPort/AI I2C host adapters. When operating with new application software that uses advanced features, speed increases up to 100X faster are possible. Master and Slave, Transmit and Receive, iPort/USB supports I2C message modes including Multi-Master, Arbitration Loss Detection, with messages from 1 to 32K bytes in length. Start sending I2C messages in minutes using our Message Manager or Message Center applications included with each adapter. 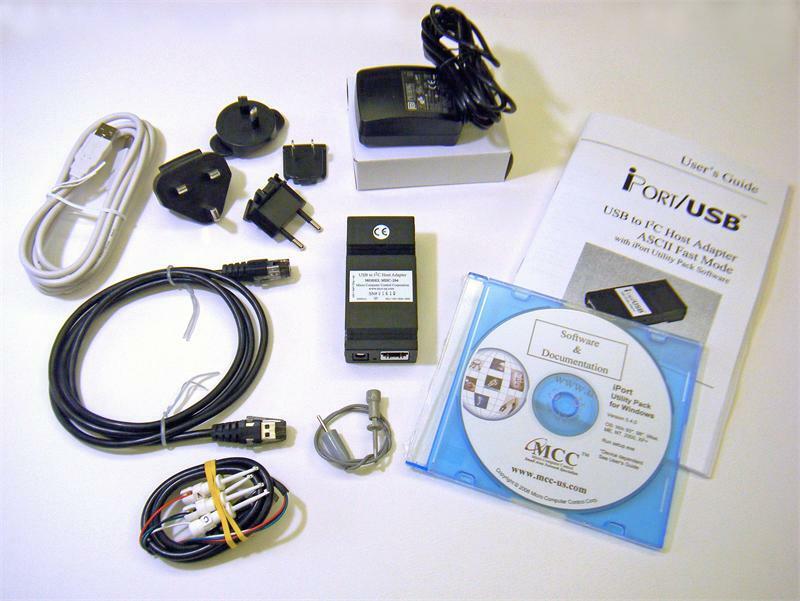 You can also use your computer's terminal emulation software (like Windows' Hyperterminal Program), or create your own custom I2C applications using any programming tool that can access your computer's (virtual) serial port. Note: [CR] = Carriage Return Code or Enter Key. This command resets the iPort/USB to its default state. Disconnect from the I2C Bus. Set the destination I2C Slave Address for subsequent Master Transmit or Receive operations. Enable/Disable data entry echo and prompts. Select serial communication handshaking protocol. Enables/Disables iPort/USB response to I2C Bus General Call (00) messages. Controls display format of received message data. Sets iPort/USB's own I2C Slave Address. iPort/USB will respond to I2C Bus messages sent to this address. Activates iPort/USB as an I2C device attached to the bus. Write the specified data bytes to a requesting I2C Master Receiver device. Direct control of I2C Clock (SCL) and Data (SDA) lines. See User's Guide for details. How many bytes did slave acknowledge. Product Development: Software/Hardware Testing and Troubleshooting. Manufacturing: Testing and Debugging, EEPROM Programming, Quality Control. Field Service: Field diagnosis, Repair service and Verification, Product Updates. 4 Channel I2C Bus Multiplexer Board (#IP-201). See our Online Catalog for ordering information.